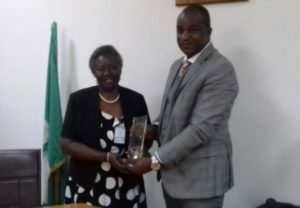 The Vice President of Chartered Institute of Taxation of Nigeria (CITN), Ms Olajumoke Simplice, fcti, has emphasised the need for effective synergy between the Independent Corrupt Practices and Other Related Offences Commission (ICPC) and the Institute in order to achieve more success in the war against corruption in Nigeria. Delivering an address while on a courtesy visit to ICPC recently, Ms Simplice said that the visit was to further foster collaboration with the Commission, adding that CITN in 2015 had a Memorandum of Understanding (MOU) with ICPC on training of staff on how to investigate and prosecute tax evasion offenders. Explaining further, the Vice President said that the main purpose of the visit was to complete and sign the MOU so that the collaboration between the two organisations could gain traction and reduce the incidence of tax evasion among Nigerians to the barest minimum. The Acting Chairman, ICPC, Dr. Musa Usman Abubakar while welcoming members of the Institute, affirmed the existing relationship between ICPC and the institute, stating that the Commission was ready to further collaborate and work with it. He acknowledged the fact that tax evasion was a form of corruption that needed to be tackled. Dr. Abubakar commended CITN on the proposed training for ICPC staff, saying that professionals were key operators in the fight against corruption. He gave assurance of the Commission’s readiness to make its training facilities available for the exercise. The ICPC Acting Chairman further said that the Commission had worked on the MOU and had made some observations which would be effected in it before it was signed. The Vice President of CITN was in the Commission with her deputy and other senior members of the institute.